Happy New Year friends and family. I don't make News Years Resolutions. I just pray that I will continue to be come a better person and have the strength and courage to make the right decisions. And I have goals that I would like to achieve in my running. #1 priority this year is being in the best shape possible for Western States. The photo to the left, I borrowed from off the WS website shows a section of this beautiful California course. I hope to run a sub 24 hour here and all my events and training for the next 6 months are targeted toward reaching that goal. More on that as the year progresses. In the meantime here is what's planned so far. January. I will begin with the Frosty 50K. I'm not racing this but using it as a long workout while running with my friend and fellow NCRC member Jenn. Two weeks later is the Swinging Bridge 50K, again a training run. Why? Because of February. February. Rocky Raccoon 100 miler. I will be going all out for a 100 mile PR at this one. 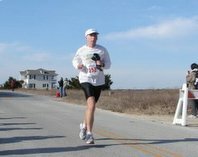 Two weeks later will be the Myrtle Beach Marathon. I'm doing it for two reasons. #1, to run with Karla as she begins preparing to get back into normal training and #2, for the NCRC Party!! In between I'll volunteer at Holiday Lake again. I'll follow that up a week later with the Mt. Mitchell Challenge 40 miler. My first time there and I just hope the weather makes it runnable. March. Umstead Trail Marathon and two weeks later I hope to run the Gator Trail 50k. April. Start off the month volunteering at the Umstead 100 and once again pacing the Trail Princess. Two weeks later is Bull Run Run 50 mile. I hope to be fresh and in shape and have no mud! Finish up the month with Promise LAnd 50K++, one of my favorites and probably the prettiest course in the East as well as one of the toughest. May. I hope to return to Capon Valley50K if it is held again. The rest of the month is just training for WS. June. Training and tapering for WS. Sept. I hope to run the Blue Ridge Relay if I can get on a team with Jenn. Hinson Lake 24 hour again. robably run some 5 and 10k's for fun and speedwork. Nov. Help at Masochist. I really hate not to run it but I'm afraid I need to skip it to make my marathon goals. Richmond Marathon and probably back to Derby 50K. Good luck with your WS training program and at Rocky Raccoon. I'm in the 50 at Rocky and will be working the Dam aid station after I finish. See you in Huntsville! Thanks Brad. I hope you have a good 50 miler at Rocky. Be sure to introduce yourself.